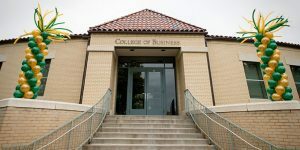 Colorado State’s Online MBA is unique in that the degree is earned 100 percent online, as opposed to many other programs that require an on-campus component. Because of this, students can earn their degree from anywhere in the world. The 21-month, 42-credit program is delivered via self-paced lectures over the course of five semesters. Students who require more time can spread this out and take up to five years to complete the MBA, if they so choose. The school’s advanced technology allows students to take online classes and watch recorded lectures while receiving the exact same content as the students on campus. By allowing the class to continue working and determine their own schedule, students are presented with the unique opportunity of immediately applying classroom learning to their ongoing professional careers. Similar to the other MBA formats at Colorado State, the Online MBA is a 42-credit program comprised of 36 core credits and six elective credits. Students can choose their own pace, taking between two and five years to complete the program, depending on their schedules and other commitments. The estimated tuition and fees for the CSU Online MBA for full-time students is $41,559, and $42,258 for part-time students. A few select scholarships are offered to online MBA students, as well as various grants, loans, and work study opportunities. Unlike many other MBA programs, applicants to the Online MBA do not need to submit a GMAT score, as the school believes that evaluating old test scores after several years of work experience is an antiquated requirement. A completed application consists of a data form, transcripts from all institutions attended with a minimum GPA of a 3.0, proof of at least four years of work experience, a résumé and a statement of purpose, and three professional recommendations.